Bonus: the recipe is about as easy as boiling water. Pumpkin spice? Psh. Sorry, but the Internet has spoken: Fall's hottest flavor is now salted caramel. What’s a health-conscious eater to do? We could at least justify our love of pumpkin spice since pumpkin is loaded with vitamin A and fiber, and both cinnamon and ginger, key components of the “spice," have health benefits as well. But caramel, which is traditionally made from boiling sugar? That’s a tough one to justify. Until now. 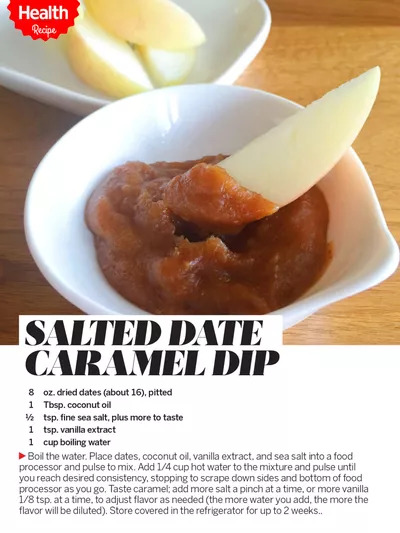 Thanks to the luscious, caramel-like flavor of dried dates, you can enjoy salted caramel guilt-free. They’re chock-full of fiber, potassium, iron, and antioxidants. And unlike traditional caramel, which can be tricky to make, date caramel requires no cooking (except for boiling some water). Plus, it keeps well in the fridge (up to two weeks), and it's so versatile. Here are just a few healthy suggestions for enjoying it: Slice up an apple and use it as a dip. Mix it into plain yogurt, oatmeal, or blend it into your favorite smoothie. It also makes a great spread for whole grain pancakes or waffles, or for an upgraded PBJ—just use it in place of jam.